Other panels, specifically the ‘MyBangor Service News’ and the ‘Your Announcements’ panels, on the MyBangor home page will provide you with information, announcements and alerts that are relevant to you specifically. They may be to inform you about a workshop on Employability being held for students within your School, that you need to re-register and may not have done so, job opportunities, IT System announcements, messages from your course representatives or Peer Guides or any other announcements that staff and others supporting your studies need you to see or that may be useful to you. Once you have logged in you will find a range of online services in the ‘Online Services’ section of the site menu (in the black bar at the top of the page). One of the roles of MyBangor is to present News, Events and other information to you that is both timely and relevant. 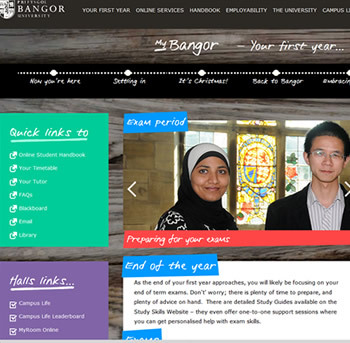 The MyBangor homepage contains panels which show this information. News and Events from across the academic schools and colleges is presented on this page, helping you to find out more about research, student and general University news.